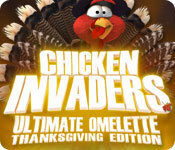 Chicken Invaders 4: Ultimate Omelette Thanksgiving Edition is rated 3.3 out of 5 by 15. Rated 5 out of 5 by hrhqoroses from Great fun! If you love Chicken Invaders, you won't be disappointed with this latest offering. While the levels are the same as Chicken Invaders 4, the chickens have transformed into turkeys for Thanksgiving, and the music is absolutely hilarious! To address one previous review -- the game DOES save if you exit, however, if you lose all of your lives, it's just like an arcade game -- yes, you DO have to start over. That's the point of building skill. After a while, you get to know the levels and if you get good enough, you can beat the game on the hardest difficulty without ever losing a life! It's something to strive for instead of the game holding your hand the whole way. There are three difficulty settings to appeal to ANY level of gamer. All in all, an amusing and fun game! Rated 5 out of 5 by odle5 from Love these Invaders games I loved the old Space Invaders games. This game is great! Love the Turkeys all dressed up for the holiday. Instead of chickens, you fight off the alien turkeys. You gather pumpkins and drumsticks. Love it! Fun to play. It is exactly like all the other chicken invaders games but it is still fun!!!!! Rated 5 out of 5 by CAHbKA from Good and Funny! Chicken Invaders was my first download from BigFish! I still remember all those great emotions! And I am still big fan of this game! Rated 5 out of 5 by pennmom36 from Absolutely Love This Game! Incredible graphics and a good sense of humor. This game is addicting and now I need to play the other 3 games as well! 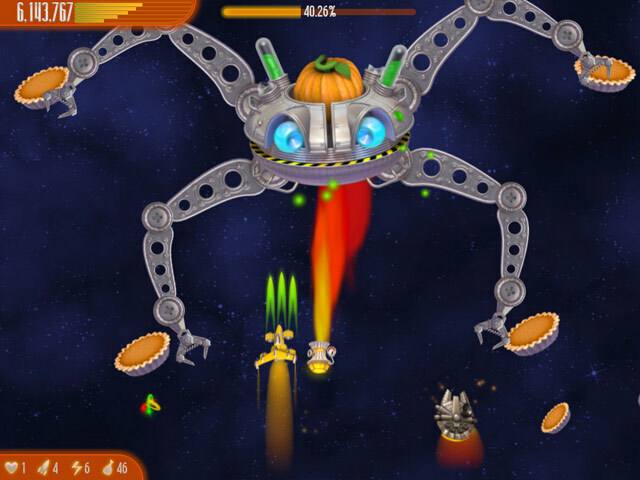 It is basically a space invaders type game on steroids (the turkeys are on steroids too) You are in a spacejet and you shoot flying turkeys in space, no worries, it's in another galaxy! These turkeys are ruthless and shoot eggs at you and there are asteroids to watch out for as well. If you kill a full grown turkey a pumpkin will fall or turkey legs and you want to grab them if possible for extra points. I only wish that when you lose all your lives you didn't have to start all over, enjoy! Rated 5 out of 5 by Janette5 from Chicken Invaders Remake with the cutest graphics! If you've played Chicken Invaders before - this is of course a remake of number 4 with turkeys. The graphics are the best yet I've seen in any chicken invaders series and they've always had fun graphics. 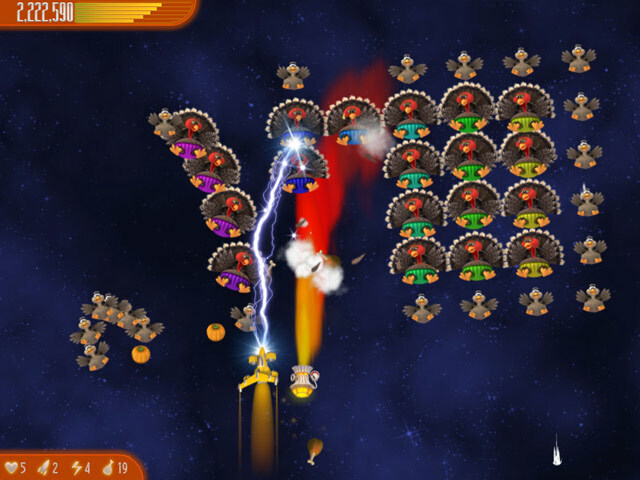 If you've not played Chicken Invaders before - This is a hybrid of space invaders and asteroids for the 21st century. You shoot and avoid the turkeys who fight back and at the end of every level there is a boss you have to defeat. The turkeys move in different directions and can come from all sides. You get different weapons and upgrades - if you can catch them in the game and you need the right weapon or strength for the right boss else you'll need to replay the level to have more lives or a stronger weapon at the end. There are three levels of difficulty, but the easy level is in itself challenging until you've practised a bit. It is a fast-paced game. You can play with keyboard or mouse and choose to have music / sounds or not. 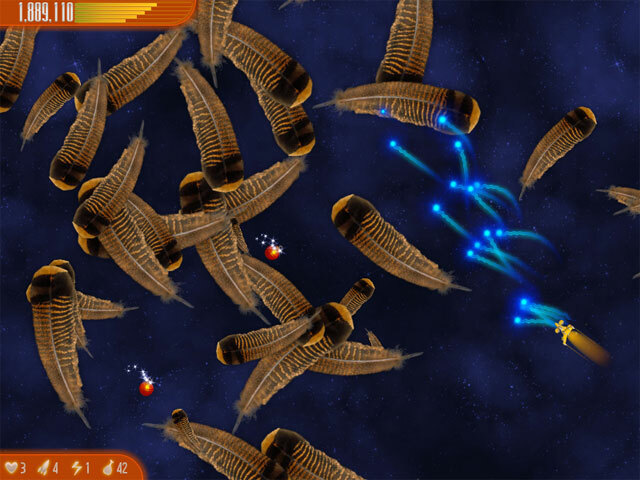 I personally have always loved space invader type games since I started playing them around the time computer games were invented and I find the chicken invaders games to be absolutely fun and enjoyable. Rated 5 out of 5 by chuckho from What's not to love One of the best shooters in the history of gaming. Rated 4 out of 5 by Kirbyzzzz2 from Same as game before but still very good I liked this game but this is the same as the original and this should come with the original since it is teh same exact levels. Rated 4 out of 5 by happylabs717 from Same as Chicken Invaders 4: Ultimate Omelette Easter Edition I like the Chicken Invader Games because I grew up with Space Invaders. Only problem is, if you purchased the Easter Edition, this is the same exact game only it has turkeys and pumpkins instead of Easter graphics. If you haven't played any of the Chicken Invader games before, I highly recommend this. Rated 3 out of 5 by bluesycat from Cute and Silly Very fun and silly game. Perfect parody for those of us who just can't get enough Star Wars. But I lack the hand-eye coordination to actually PLAY the game. So I lost all my lives within the first 30 seconds a couple of times. So it's a no buy for me. But if you can manage the hand-eye stuff, this game is GREAT! Rated 2 out of 5 by carb7250 from Boo Boring and not challenging. Wouldn't recommend.